Page Title. think of this as being similar to a book title or article title. Using your keywords in the page title and a compelling call to action can help draw clicks into your site. Meta Description. The meta description backs up the page title and covers alternate phrases that you were unable to work into the page title. Domain Name. a great domain name can be a large investment, but you only have to buy it once and the renewal fees are nominal. As marketing costs go up the value of organic looking marketing (like a strong domain name) increase. Read this article about domain names and click potential. File Names. it is just as easy to use relevant file names as it is to use file names that do not indicate anything about the page. The relevant file name will drive more free traffic than an irrelevant file name. And some websites use the full URL as the anchor text for links, so a relevant descriptive file name helps give you focused anchor text. The Value of a Top Google Ranking. reviews past research to show how frequently searchers click on the top few search results. Brand Management. Learn how to structure your site and promote other positive coverage to help keep your search results clean and brand friendly. When people search they are in a rush to complete a task and process a significant amount of information quickly. Most search queries tend to be research related. Creating comparison content and a reviews sections can help capture a large portion of research keyword traffic while presenting a search result that better matches user intent, and inspires enough confidence to convert. 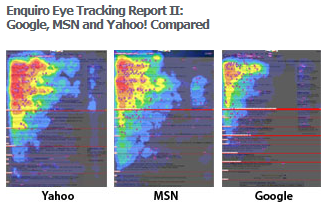 Gord Hotchkiss published 2 eye tracking studies which show how people interact with search results. They are on sale for $149 each at the Enquiro website, and I did a high level review here. In the above heat map notice how good Google is at keeping attention focused in the upper left corner of the search results. This focus of attention is precisely why traffic increases logarithmically as your rankings improve. There is far more upside in bringing a #5 ranking up to #2 than there is bringing a #40 ranking up to #12. In one vertical I have sites of roughly similar design and content quality, but the site with more link equity ranks better for many high value queries (like #1 instead of #5) and makes 3 times as much money. Using analytics tells you what pages are getting traffic. With that data you can focus marketing activities on those pages and optimize your internal link structure to help promote the most important pages.